Imagine an orchard. Imagine a place where nature unrestrictedly delivers the finest scions. Imagine our farmers’ caring hands that attentively choose the best fruit for you. Imagine a perfect fruit, a perfect drop, and a product of our best scientists’ innovative technology. In our Nectar family we don’t care only about the perfect taste, but also about the environment that’s left for our children. Because we respect the nature, the nature rewards us with the best organic flavors, high in vitamins, minerals and other purest nutrients. The organic label found on our juice that makes it unique on our market, confirms the leader position of Nectar company and attests to the devotion for preserving consumers’ health. Organic farming means respecting the complex demands and principles of the organic agriculture, from breeding, to picking and finally packing and transporting. The organic certificate proves that every step in this extraordinary production process has been fully and regularly completed. The soil where organic fruit is cultivated is ecologically healthy, protected from harmful environmental influences, high biological activity. Distance from factories, highways and other sources of polution contributes to the soil’s fertility and biological diversity. Organic manufacturing means applying natural substance procedures in order to sustain the structure of the soil and increase its fertility. By proper manuring and usage of tools in the soil processing, the balance of the ecological system is achieved. In soil processing using chemical pollutants, pesticides and fertilizers is forbidden, which enables preservation of high nutritive value of the organic fruits. Organic fruits grow and ripe in pure, intact nature, far from harmful influences of the contemporary age. Unpolluted air, healthy soil and solar energy contribute to the power and richness of their taste. Thanks to the ecologically healthy environment and breeding principles, the organic fruits are characterized by high biological and nutritive value, intensive color, smell and aroma. 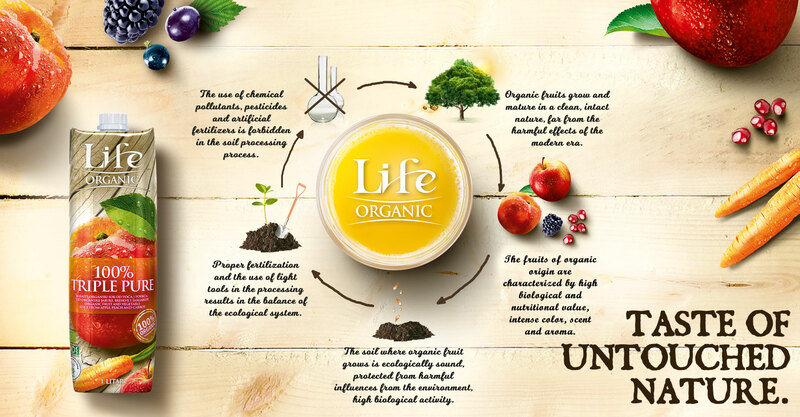 Discover your favorite Organic flavor and fund our more about it!